Sometimes Grandparents can be hard to buy gifts for, they seem to have everything already. But hey you can’t go wrong with darling gifts of grand kids, right!?! In this post I’m going to share a couple of ideas for personalized photo gifts. 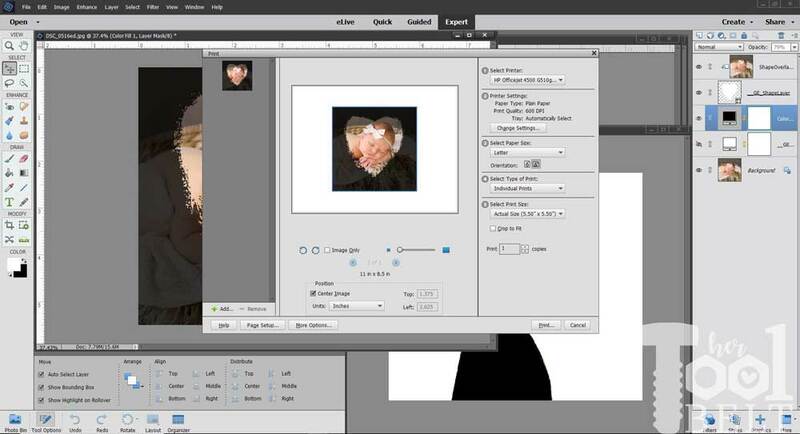 To make the photo gifts, I will be using Photoshop Elements 2018. I have been using Photoshop Elements ever since I graduated from trying to do digital scrapbooking with power point 🙂 Power point got the job done, but using the layers in Elements made scrapbooking so much easier. 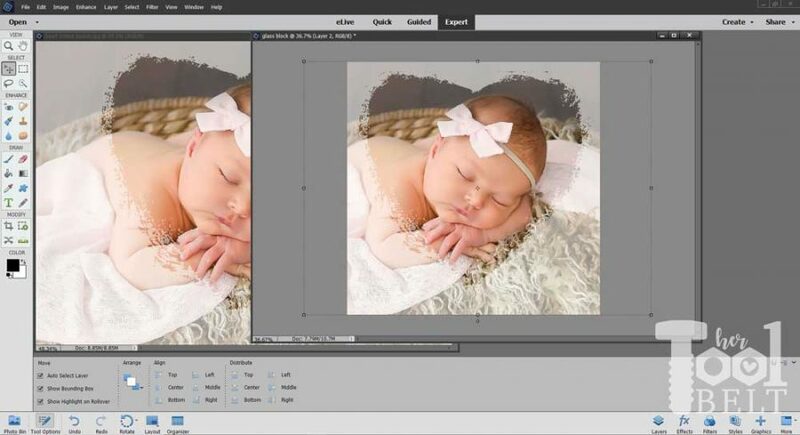 Adobe just released their 2018 version, and it has some fun editing tricks to make cute personalized photo gift projects. 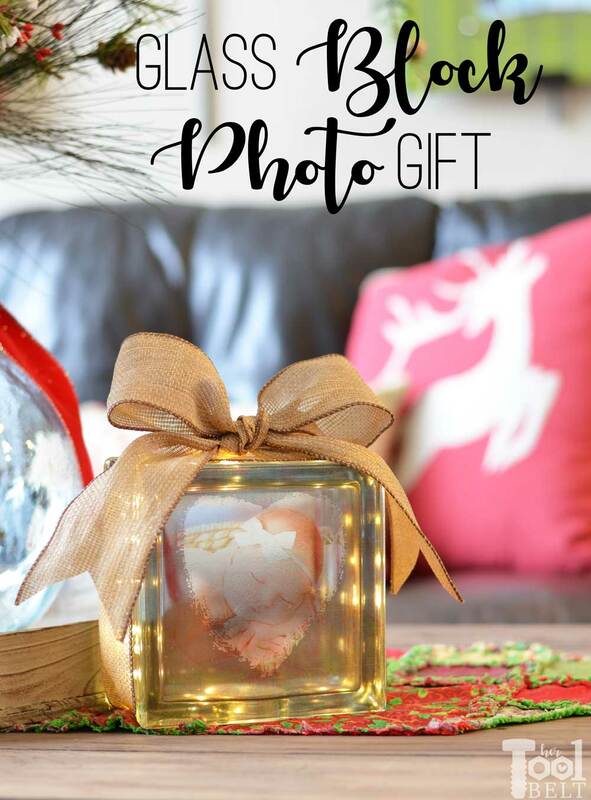 One photo gift is a cute illuminated glass block. 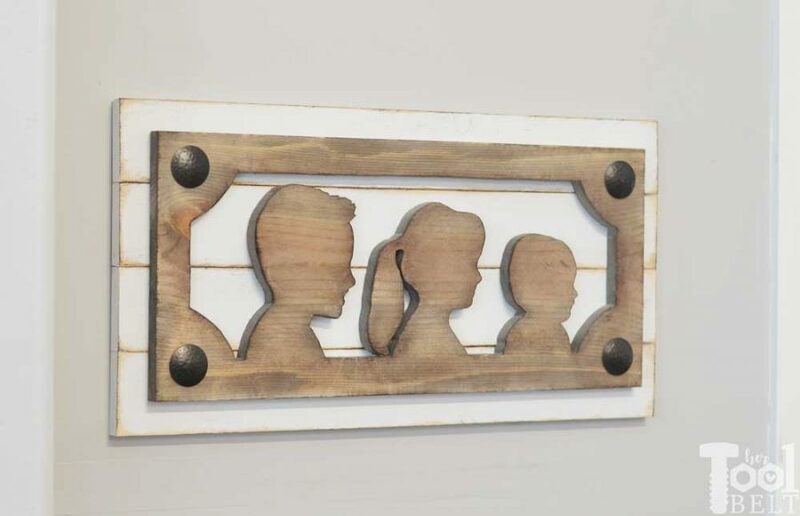 The other is a farmhouse style silhouette portrait out of wood. 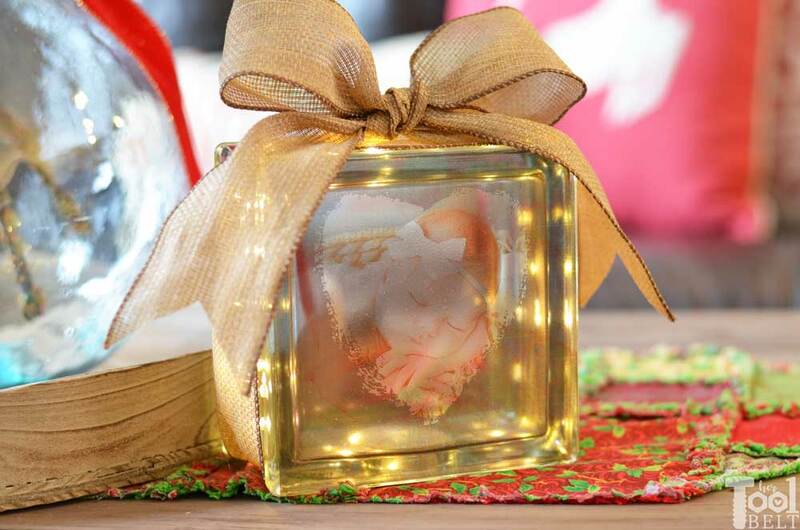 Making the glass block photo gift is really easy and fun. You’ll need Photoshop Elements, but you can get a free 30 day trial. To make the photo sticker, I chose my favorite picture of my daughter and followed the easy tutorial by It’s Always Autumn. She provides a nice video to follow along with. A couple of notes about the process. At first I chose a light background for my picture, but when I applied the sticker onto the glass it was hard to see the shape. I switched the background to a dark background and that made it easier to see when applied to the block. Make sure to measure the size of your block before cropping the photo, there are different sizes of blocks, mine is 5 1/2″ x 5 1/2″. When printing the picture onto the clear sticker paper, make sure you set your print settings to actual size. Once I attached my photo sticker to the glass block, I wrapped some fairy lights around the outside of the block. To finish it off, I added ribbon and tied a bow. Super simple and fun. 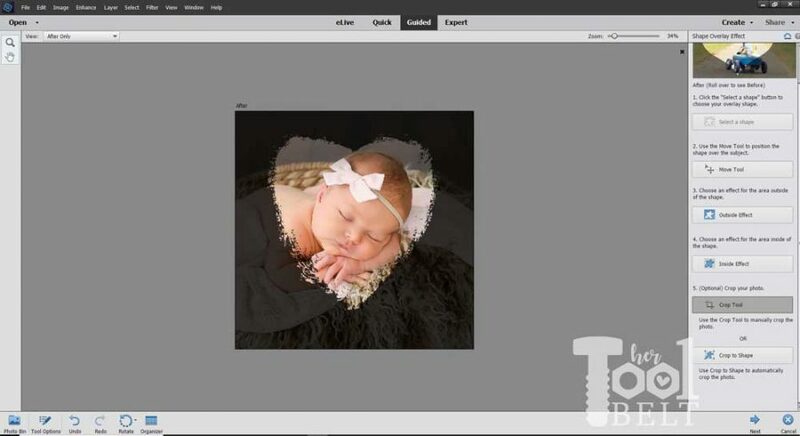 To make the silhouettes you’ll need Photoshop Elements, you can get a free 30 day trial. The idea for this project is from a picture I spotted on Pinterest that wasn’t linked to it’s proper source, after some detective work, I finally found the origin. 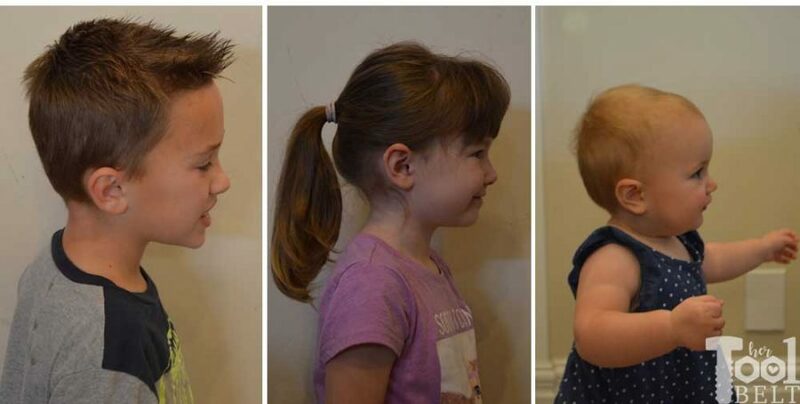 Depending on the age of your kids, this may be the most difficult step of this project! 🙂 Take profile shots of each person for the silhouette portrait. The quality doesn’t need to be that great. Photoshop elements has a pretty slick way of turning profile shots into silhouettes. I followed The Gingerbread House’s video tutorial for making the silhouettes. The open area in the ‘frame’ is 8 1/4″, so make sure you size the height of each head less than that. My tallest silhouette head is 7 3/4″ and the shortest is 5 3/4″ from the top of the head to the lower frame border. Here are the patters for the Left and Right Brackets. Download pattern here. 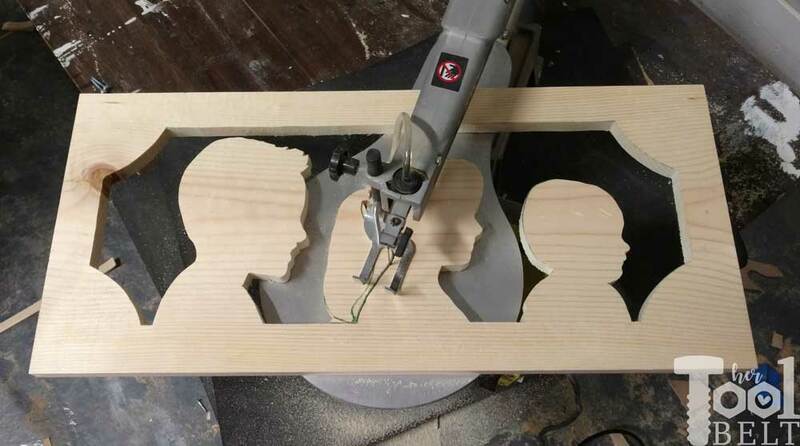 Cut out the brackets inside (curvy part) and the silhouette heads. Space the silhouette heads along the board as desired. Place the right bracket on the board and mark where to cut the board length to. Trace all of the patterns onto the board, connect the lines between the left and right upper frames and left and right lower frames. 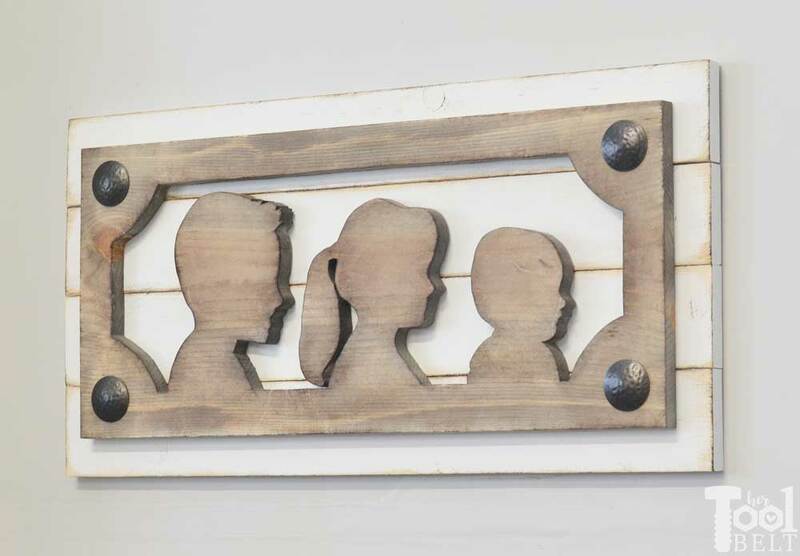 Use a scroll saw or jig saw to cut out the pattern. After cutting out the wood, sand as needed to smooth any rough areas. Stain or paint the silhouettes whatever colors you’d like. I used Varathane wood accelerator, antiqued with a little Varathane Kona and a quick rub of wood conditioner to blend it. Measure the length of the silhouette board. Add 2 3/4″ to the length of the silhouette board measured. My board is 25 1/4″ + 2 3/4″ = 28″. 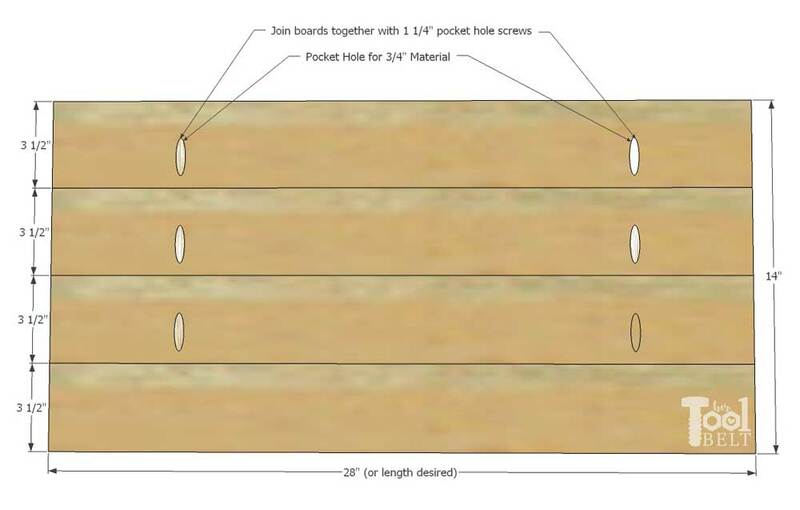 Cut 4 – 1×4 boards to that length (28″). Drill a couple of pocket holes for 3/4″ material in the back of 3 boards. Paint or stain the boards as desired. I painted mine with Rustoleum Linen White chalked paint. After the paint dried I used sandpaper to rough up the edges and used a tiny amount of Kona to highlight the edges. Secure the silhouette cut out to the front of the 1×4 boards with some wood glue and 1 1/4″ brad nails. If you want, add some decorative nail heads to the corners. Tell me what you think, are these nail heads too big? *** Disclosure: Adobe provided some products for this post. 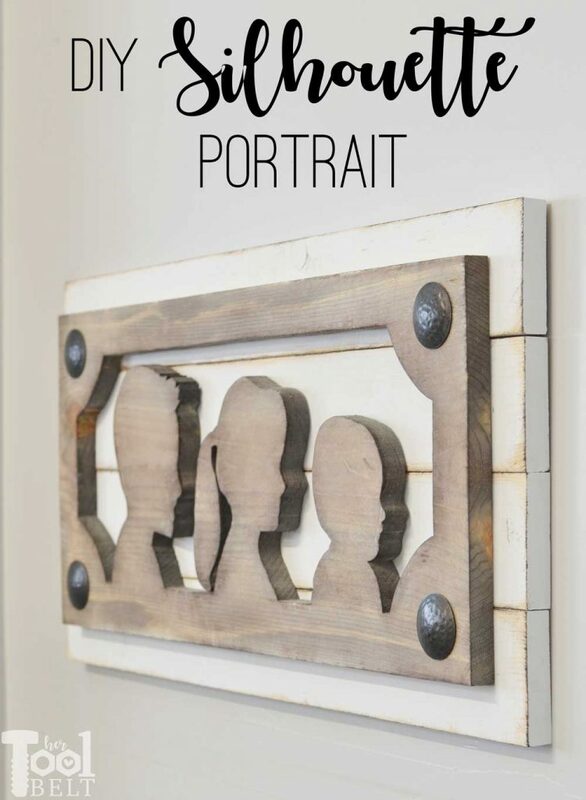 wow, the wood portrait is amazing! An amazing new twist to giving silhouettes as gifts. Love this! That turned out so rad! Incredible!